Hello everyone. We finally have a new Beta version of VRidge! This is our promised update to which we refer as the “Tracking Update”. It brings some highly useful features that we believe will help you play and use many more VR experience. Remember that this is the Beta phase of this update. It can still contain bugs or errors which we will try to fix as soon as we can. We will deploy it to stable channel for everyone when we will fix all the issues. As you’ve seen in our previous announcement, we were preparing a special control model that will let us use a common hardware that is available for everyone to control our bodies in virtual reality. We believe it will be very useful for you in VR games that require SteamVR input. We have a video guide which will teach you how to use our new control methods in no time! To control your body in virtual reality. 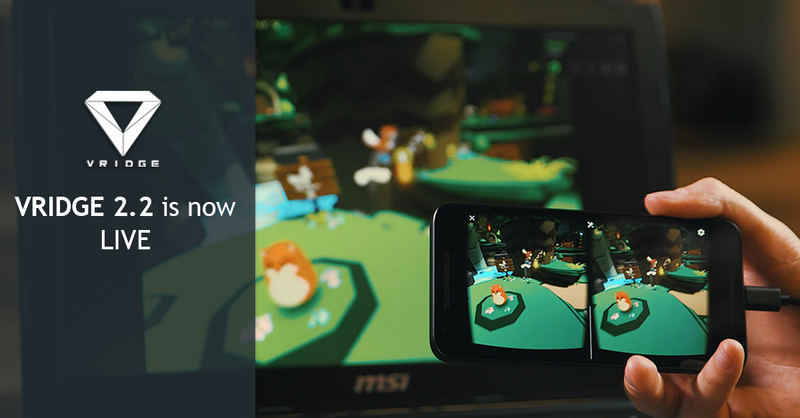 This option is perfect for shooters, slow paced VR games, exploration games and so on. These options are also highly configurable! Let us know what do you think about it. Your feedback is always welcome! This is also the best moment to report bugs that you can find. It would be great if we could make this feature flawless before it goes live for everyone. 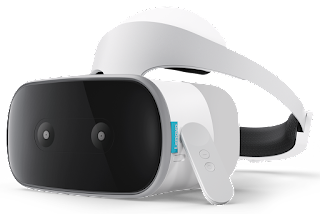 If you have Lenovo Mirage Solo or any other Daydream WorldSense device, you can now freely move around in space with VRidge fully reflecting your positional movement in SteamVR worlds. We are also actively trying to get our hands on Daydream 6DOF controllers dev kit so we can be ready on day 1 of consumer availability. This is a feature that was requested many times. It was developed months ago but due to issues related to AR Core SDK it was postponed for a long time. We are releasing AR Core positional tracking now but we are marking it as “experimental”. Unfortunately, we don’t think that this is viable solution for positional tracking but if you want to give it a shot anyway - you can now easily do so! As this is an experimental feature - it is not configurable within RiftCat launcher. It is hidden in VRidge.cfg. To enable it, simply go to RiftCat/Config folder and edit your VRidge.cfg file. Find “ArcoreTrackingEnabled” and change its value to “true”. Remember to use a device that can support AR Core with Google AR Core software installed. 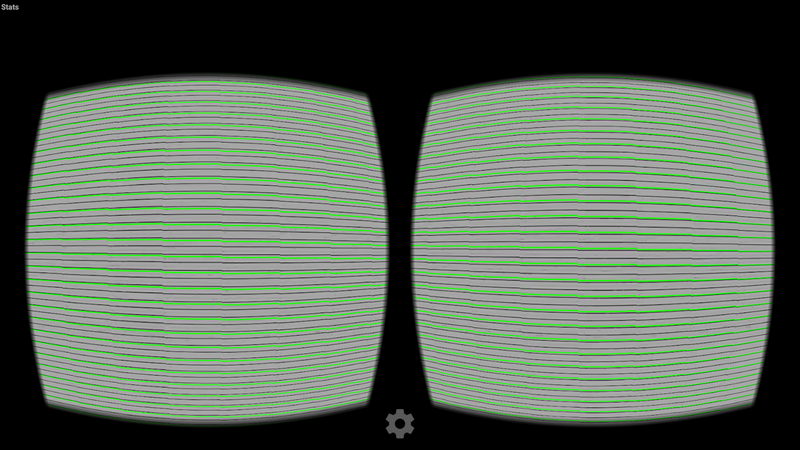 We have LIVE settings that you can change on the fly, but it’s inconvenient to constantly take off your VR headset. That’s why we have added an option to enable camera passthrough so you could see what’s in front of you. Switching between camera view and normal VRidge view is very simple. Just double tap your phone screen or capacitive button of your headset. You can also use Gear VR touchpad to do it and if you prefer keyboard shortcut, simply press: CTRL + ALT + SHIFT + S to switch. Before using this option, make sure that you have front facing camera on your VR device and if you are using a phone, that your cardboard is not obscuring the camera view. With new tracking options, we wanted to expand on the idea of integrations. We made Integrations tab a little bit more informative so it’s easier for you to navigate. It contains all settings for above mentioned Xbox and Mouse + Keyboard integrations. 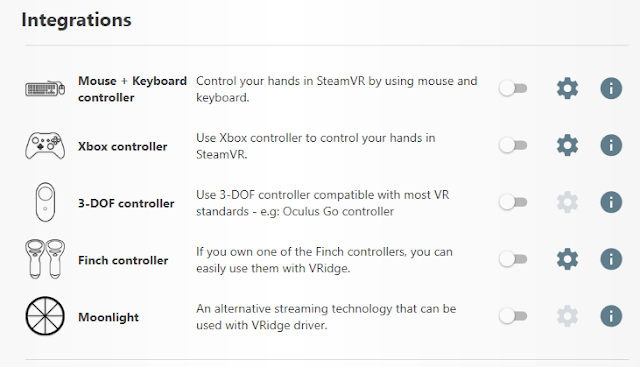 You can also turn on/off a 3-DOF controller available with Daydream View, Lenovo Mirage Solo, Oculus Go or HTC Vive Focus. SteamVR allows for custom icons. So we took the liberty to create our own! Now you will be able to easily recognize whether it’s VRidge connected to SteamVR or something else. You might have heard about Finch Shift controllers. We cooperated with them and created a native support for their controllers in VRidge. 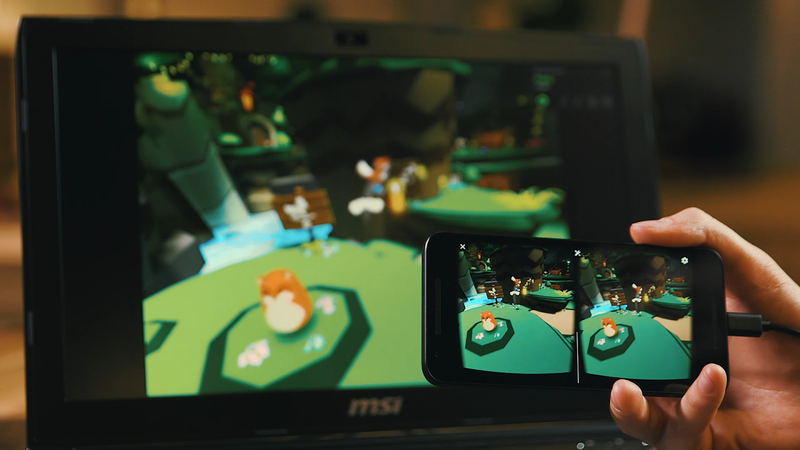 Their solution will soon be available with various VR hardware vendors so if you’ll get a hold of them, don’t hesitate to try them with VRidge! We have added an option to show a login button on the connection screen (so you could log in without connecting devices). It’s turned off by default to not clutter the connection screen for new users but if you need something like that for convenience you can easily turn this option in VRidge general settings. Once upon a time. We have added an option to adjust IPD and Scale value for your VR view. It was added in a rush so it was pretty clunky to use. We took a look at this feature and adjusted it. The minimum and maximum values were not useful at all so we have trimmed the range in which you can move the slider so it’s much easier to control. We have also provided a numerical value so it’s easier to share your setting with others. “Could not start SteamVR” - sounds familiar? It could have happened a lot to you while VRidge still launched and started streaming. You just had to wait for SteamVR to open. This issue should be fixed now. We have increased the time that VRidge waits for SteamVR to open so this timeout should happen less frequently. This is what happens when your whole dev team works on SSDs. Oops! New possibilities are coming to vridge-api. This includes fixing several problems with API async offset and introducing a way to remap your 3DOF controllers to 6DOF using the same virtual arm model that we use with Gear VR/Go/Focus/Daydream controllers. VRidge tracking changed a lot internally but our goal was to keep it backwards compatible. API server is updated in beta version but GitHub repo is not yet up to date. We will update docs and sample in following weeks, during 2.3 beta. You can join the discussion here. Improved streaming stability, especially with high bitrates. 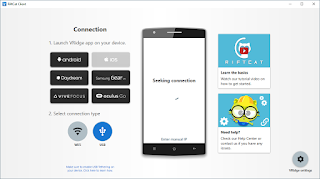 Due to new features and SDKs, our VRidge Android app will ask for several new permissions. You might be asked to grant more permission (Camera and Bluetooth). This is required by ARCore and Finch SDKs. Don't worry, we're not tracking your location or sending camera feed anywhere. With this update, there is also a bit of new text that was created for our software. 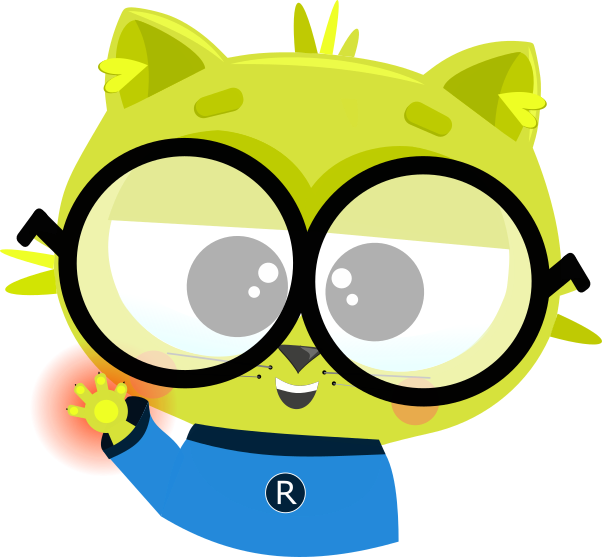 As you might be already aware, RiftCat is available in many languages thanks to our great community that helped us translate RiftCat via CrowdIn platform. 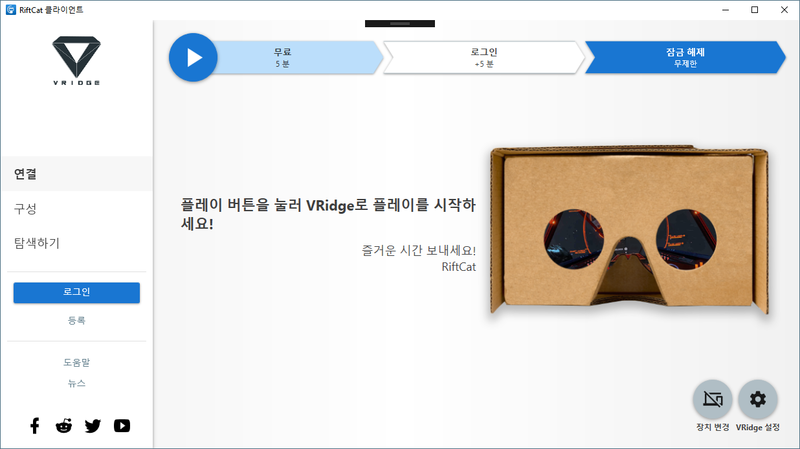 Help us bring this new update in multiple languages so everyone will be able to join PC VR gaming. We are giving away VRidge full version key for active contributors so it’s definitely worth it. This Beta update was possible thanks to our great community that supports us throughout all of the years. We are sure that with your help we’ll be able to quickly bring this update to everyone and change the way we use VR with VRidge thanks to our new tracking methods. We have just released a smaller Beta update for VRidge. It's a package of several fixes that we wanted to release as soon as possible. Our big "Tracking Update" is still coming up and it's very close by so stay tuned for good news! Fixed freeze in SteamVR driver if VRidge was stopped at unfortunate moment. Updated NVENC compatibility detection to properly detect GeForce 2000 series cards. Crashes will now log more data to vridge.log file. This patch updates only RiftCat desktop client. If you'd like to try it out, simply switch to Beta channel in RiftCat client options. You can also learn how to join Beta channel here. Dev Update #43 - VRidge 2.2 is now LIVE! We’ve been waiting for this moment for a long time. 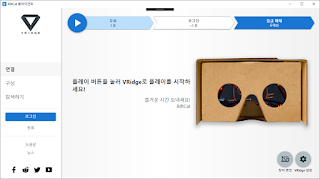 Finally we have released version 2.2 of VRidge to everyone. Your RiftCat desktop client and VRidge mobile app should automatically update. We couldn’t have made it without your intensive Beta tests! Thank you for helping us bringing this update to everyone. With this update we were able to utilize all major SDKs to bring you the support of these extraordinary all-in-one headsets. If you own any of these, your experience with VRidge will now go to the next level. 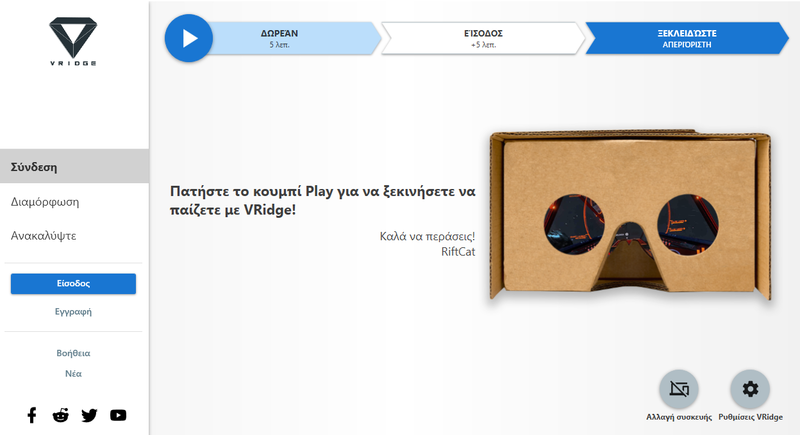 We also want VRidge to be distributed via their official stores for easier installation. HTC Vive Focus version is already available on the Viveport mobile store. Oculus Home and Daydream version is in the approval process. 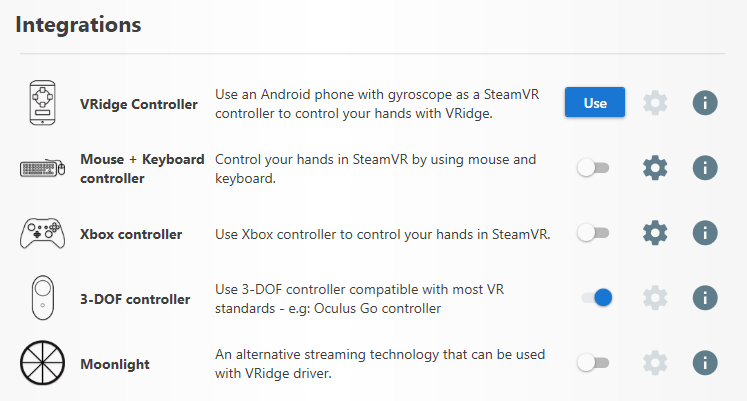 You can now use HTC Vive Focus, Gear VR, Oculus Go or Daydream controller in SteamVR! We have came up with an idea how to map the missing HTC Vive buttons to the controllers by using a little bit of space from the touchpad. To read how to operate these controllers, simply take a look at our Help Center article to learn how to use them. If your phone or AIO headset is HTC Vive Focus, Daydream, Gear VR or Oculus Go compatible it will now use reprojection. Thanks to it, the experience is much better, basically getting rid of the jitter. If you have an optimal setup - your experience should be flawless now. We will investigate if we could deliver different custom reprojection method for phones that are not VR ready. This might happen with the next update. You might want to select Prevent frame loss as "Connection mode" if you're using stable connection (5 GHz / tethering) to prevent artifacting. This usually could introduce some extra latency, but it should be smoothed out by reprojection. With multiple supported devices we had to upgrade our user experience to make it easier to pick the appropriate version. We hope that with this change it’s going to be easier to install the appropriate VRidge version for your device. Reduced VRidge's CPU load by 30-40% when using NVENC. Many Android optimizations - CPU usage should be lower across all Android devices. On average, you should see 15-20% system CPU load instead of 50-60%. This also means that heat generation should be significantly lower resulting in less "device too hot to run VR" errors. 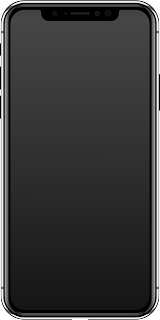 The image shows the CPU usage when optimizations are turned OFF and ON. 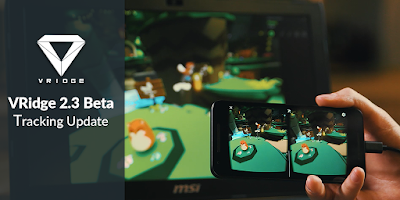 We have also disabled MSAA on Daydream to save some GPU cycles and we have updated Google VR SDK to 1.80. VRidge will now automatically select FPS based on the device refresh rate. For example, if you’ll connect to VRidge with 75Hz HTC Vive Focus headset - 75 FPS will be selected. We were able to deploy six new languages: Bulgarian, Lithuanian, Indonesian, Korean, Italian and Hungarian. Old languages got updated as well. Thank you for everyone’s contribution at our CrowdIn campaign. You did a tremendous job! All active translators will be rewarded with free VRidge key! Unfortunately we weren’t able to include some translations in this patch as they missed the submission deadline. They will be deployed with patch 2.3 so they will have to wait for the next release. FoV will now be selected automatically to improve the image quality. It will be especially effective on headsets with asymmetric FoV. Changed the way "End of Trial session" message is being displayed to user. Instead of displaying message (in one eye only due to very old bug) it will go back to lobby with localized notification message. Added Project Cars tutorial to Discover view. Lobby text ("Connected, waiting for SteamVR" should no longer become stuck and displayed on top of streaming window. Mobile app should no longer crash on reconnect sometimes. VRidge settings should no longer incorrectly stay on top of all windows in certain cases. Tethering tooltip no longer clips in certain localizations. Removed artificial +170cm HMD height that could sometimes cause incorrect API controller calculation when paired with headset that didn't send positional data. steamvr.vrsettings read-only flag will now be automatically switched off. If the file still remains locked, error message will be displayed instead of crashing. Generally other software should never lock this file but certain drivers aren't always interop-friendly. VRidge and SteamVR should now automatically start on dedicated GPU, if available. This should fix a crash on Nvidia Optimus laptops. We hope that the new update will bring your VRidge experience to the next level. We will now decide on our next development cycle so expect more news coming soon! 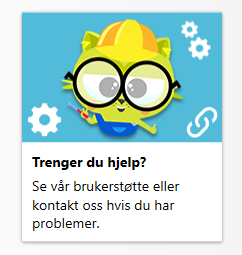 Thanks to all Beta testers and translators who helped us bring this version to everyone. We have the best community in the world.